Want to control bad breath? Don’t ignore your tongue! All those bumps and grooves on your tongue are a haven for bacteria and could be contributing to your bad breath because of the gases they give off. It’s important to take care of the tongue in addition to regular brushing and flossing. Your tongue is made up of groups of muscles that run in all directions to carry out the tongue’s many functions. Underneath your tongue is a soft, thin skin called mucous membrane. Your tongue is fastened to the jaw bone (mandible) and to the front of your throat. 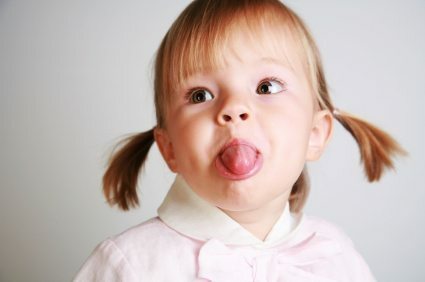 The front of the tongue is extremely flexible and works in a variety of ways, from working with the teeth to create different sounds and words, to helping you eat by moving food around your mouth while you chew. The muscles at the back of the tongue not only aid in the eating process but also in the formation of certain sounds, like the letter “k” and the hard “g” in “go”. The top of your tongue is covered by hundreds of small bumps called papillae. Inside the papillae are “taste buds” for picking up different flavours. Salty or sweet tastes are near the front of the tongue, sour tastes are mainly along the sides of the tongue and the ones for bitter tastes are at the back of the tongue. We have almost 10,000 taste buds inside our mouths! As we age, the taste buds begin to disappear from the sides and the roof of our mouth, leaving taste buds mostly on the tongue. Most people overlook the importance of cleaning their tongue. There are various ways to scrape away the bacteria that have accumulated on your tongue’s surface. No matter which method of tongue cleaning you use, you should try to clean as far back on your tongue as possible. Don’t be surprised if you find you have an active gag reflex. Gagging is a natural reaction but with time this reflex should diminish. Your toothbrush or a tongue scraper can be used to clean your tongue. With either technique, start as far back as possible and then make strokes outward, toward the front of your mouth. You need to use some pressure but of course not enough to cause irritation to your tongue. Some people find that they have less of a tendency to gag when using a tongue scraper rather than a brush. While brushing the tongue doesn’t have a long-lasting effect on bad breath, it is an important step in keeping your entire mouth healthy. According to the ADA, bad breath may be the sign of a medical disorder, such as a respiratory tract infection, chronic sinusitis, diabetes, gastrointestinal disturbance, liver or kidney ailment. If your dentist determines that your mouth is healthy, you may be referred to your family doctor or a specialist to determine the cause of bad breath. Why take care of your tongue? It is important to take care of your tongue, just like any other part of your mouth, by cleaning it properly and having it examined during your regular dental visits. At every oral health check-up, your dentist should look at your tongue for signs of potential cancer. During the exam, the soft tissue in your mouth, including the lips and gums, should also be examined. So the next time you are in for your cleaning, remember to stick your tongue out and say aah!